Happy Winter! It’s been a tough one as of late with the bitter temperatures. Our son had school cancelled Monday through Thursday of this week and is finally back at it for one day before the weekend. “Why bother?” he lamented, but that’s one less day on Fortnite, so Chris and I celebrate the return to civilization. 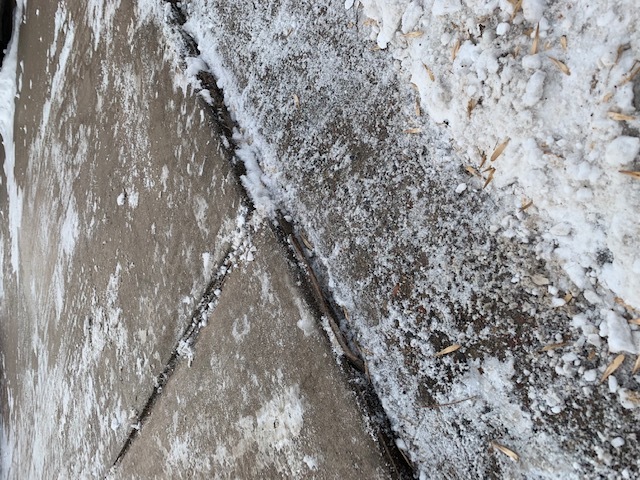 We’ve been getting a few call-ins and concerns about a common winter concrete occurrence – heaving. This is when your concrete starts to lift in various squares making the surface uneven. The water in the ground under the concrete expands as it freezes. This will essentially lift various squares. Never fear though, when the ground thaws, the concrete will go back to normal. The only time this gets troublesome is if it lifts a significant amount. We know of a fast food restaurant who had this problem in the winter. Their customers could not open the door as the concrete raised up too high to allow entrance. In these extreme cases, the concrete needs to be removed and a foam base installed. This will mitigate the extreme movement but the ground under the foam still expands and contracts so all movement cannot be eliminated. • Great for rooms with moisture (kitchens and baths) – some are waterproof and warranty outdoor use! We are currently examining which one to buy and install in our kitchen and entryway to replace our outdated and destroyed hardwood floor. We will let you know how it goes once installed! Although interest rates have risen close to the 5% mark, it’s still a seller’s market. Inventory is low (especially now – being it’s winter). I tried to show a client 4 properties last week and couldn’t because they got sold before we were able to even look. (These are properties in the $250,000-$300,000 range). If you are contemplating a sale, now is the time. Interest rates are still low, and buyers want to buy. I just attended a wonderful seminar on how to analyze an investment property. With all the terminology and spreadsheets thrown at me, the one take-away I received that anyone can remember and utilize as a “general rule of thumb” is the 1% Rule. If a property will bring in 1% or more of the purchase price in rent per month, it’s probably a good deal and going to make you money. I just got an email this morning of one such opportunity that was shared with our agents. Call me if you would like to find out what your home will most likely sell for, you have interest in great investment opportunities, or you no longer want to be a landlord and need property management help. Pamela Roble, VSM Real Estate – 763-286-7060.